Description: A LeRoy Neiman Serigraph. This LeRoy Neiman is available as an original LeRoy Neiman, call 702-222-2221 or fill the form out on this page to inquire on buying or selling LeRoy Neiman originals and LeRoy Neiman Serigraphs from NeimansOnly.com we carry Original Neimans.A limited edition of 250 numbered impressions; 50AP, 5PP, signed by the artist Knoedler Publishing's July 1996 release is LeRoy Neiman's limited edition serigraph "Roulette II". Roulette, from the French for "small wheel", grew from obscure roots to become a glamorous temptation in the great 18th century gaming rooms of Monte Carlo, and is now one of the world's most popular gambling attractions. Roulette draws every type of player, from sophisticated high rollers who appreciate the odds to nervous newcomers who can readily grasp the simple rules. Play odd or even, rouge or nuit, or if you're feeling daring, just a single number, which rewards you at 35-1. Even if you won't make a wager, it's fun to follow the bouncing ball. As collectors of LeRoy Neiman know, he has always been drawn to the subjects of sports, leisure and the ways the wealthy amuse themselves. In the casino, these themes come together like nowhere else. The artist has been a habitué of all the world's great gaming centers, from Las Vegas and Atlantic City to Monte Carlo and Baden-Baden. His studies include more than the tools of the games and the often palatial environs, but also the great variety of human characters that populate these emporiums. Like the roulette wheel itself, the featured serigraph is dominated by red and black. Neiman has portrayed a European table with a diverse international crowd in elegant evening attire. The attention of all is riveted on the board, whose numbers hold the promise of easy earnings. The players strain to place their final bets before the croupier lets loose the ball. Some are enjoying a special night out. Some are coldly calculating, working hard at their play. The very rich are blasé in the hope of some amusement. The desperate hope against reason. And the bystanders simply observe, enthralled but perhaps too timid to risk parting with their own hard-earned cash. 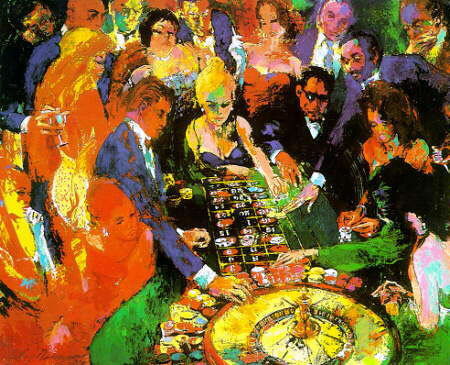 LeRoy Neiman's gambling works includes "Vegas Craps", "Vegas Blackjack", "Baden-Baden", "Stud Poker", "Baccarat", "Salle Privee" and the delightful illustrated storybook, "Monte Carlo Chase". "Roulette II" is a dramatic and insightful addition to that illustrious collection.